Introducing the compact and versatile Dometic PSB150 portable solar blanket. 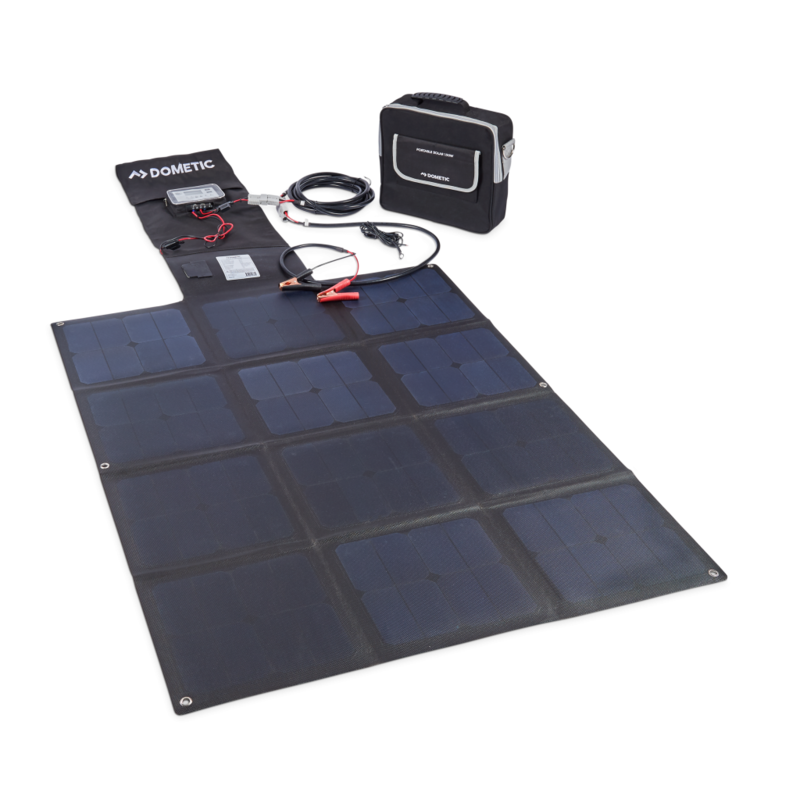 Tipping the scales at approximately one-third of the weight of an equivalent glass solar panel, the PSB150 provides campers with not only one, but six different battery charge types, including Lithium Iron Phosphate. This simple way of maintaining charge makes the PSB150 an excellent solution for almost any outdoor application. The PSB150 has been crafted from industry-leading C60 SunPower® monocrystalline cells and comes with an EFTE anti-reflective and scratch-resistant coating. The 150-watt portable solar blanket comes equipped with several built-in protection systems that protect the unit from reverse polarity, overheating and over voltage. The IP65 rating also ensures that the portable solar blanket is dust resistant and won’t short circuit when exposed to water splashes. The PSB150 has been constructed with robust materials and features a solid copper backing that ensures a long life and guarantees maximum efficiency. Despite all these industry-leading performance features, the PSB150 can be set up with ease by simply connecting the alligator clips to the battery and the solar charger and then unfolding the blanket. They say that the key to problem-solving is knowing how to use the resources that are available around you, and one thing everyone has access to is the sun. The Dometic PSB150 portable solar blanket follows this mantra by using the natural resource of the sun to keep adventurers charged whilst they’re on the move and relieve the stress that comes with not having power when living off the grid. ▪ Made from efficient C60 SunPower® monocrystalline cells. ▪ Integrated with an IP65 rated, 15 A, 5-stage PWM solar charge controller that prevents the battery from over or under charging. ▪ Can charge up to six different battery types, including Lithium Iron Phosphate (LiFePo4), AGM, GEL, Wet, Calcium & LTO. ▪ Anti-reflective EFTE coating ensures high corrosion resistance and excellent performance. ▪ Built-in LCD screen displays voltage, charging current, charging capacity, battery type, and fault codes. ▪ Approximately one-third of the weight of equivalent glass solar panels. ▪ Comes with 5-meter cable and Anderson connector which minimize voltage drops, 1.5 m alligator clips and a carry bag. For more information on the PSB150 and more great Dometic products, please visit: http://www.dometic.com.